GFDL has developed a new variable-resolution global model with the ability to represent convective-scale features that serves as a prototype of the Next Generation Global Prediction System. This prediction system maintains the skill in large-scale features while simultaneously improving the prediction skill of convectively-driven mesoscale phenomena. The conceptual simplicity of the stretched-grid approach and its ability to efficiently reach convective-scale resolutions are beneficial to most users of FV3-based models. Prediction of convective-scale storms, such as severe thunderstorms or tornadoes, has been traditionally performed with limited-area models. Issues related to the limited extent of the domain and the external boundary conditions remain significant challenges, so a global convection-permitting model without side boundaries is potentially more advantageous for mesoscale prediction. However, present-day computing resources are insufficient to support real-time global convective-scale weather prediction. Variable-resolution capabilities within the Finite-Volume Cubed-Sphere Dynamical Core (FV3) allow a high-resolution region within the global domain, enabling the model to efficiently reach higher resolutions with fewer of the disadvantages of limited-area models. GFDL scientists have developed a new global model, called the finite-volume Global Forecast System (fvGFS), coupling FV3 with the GFS physical parameterizations, which has become the prototype for the National Weather Service’s Next-Generation Global Prediction System (NGGPS) and Unified Forecast System (UFS). At GFDL, a research version of fvGFS is being continuously developed and maintained with new and enhanced features including convective-scale prediction. 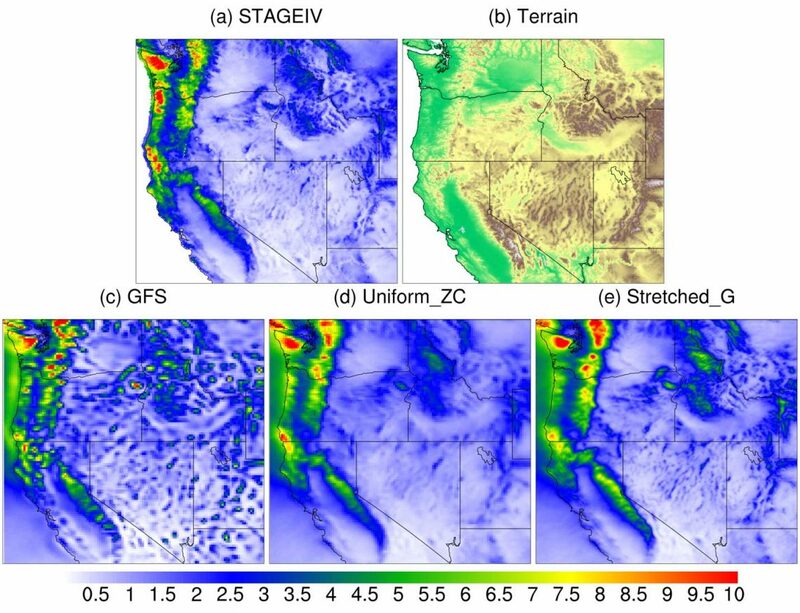 In this study, the authors use a version of fvGFS developed at GFDL to perform convective-scale prediction by using FV3’s grid-stretching capabilities to simply and efficiently reach a 4-km resolution over the Contiguous United States. Convective-scale prediction is improved by implementing an upgraded six-category cloud microphysics scheme. Statistics gathered from two years of simulations by the GFS and select configurations of fvGFS are carefully examined. The variable-resolution fvGFS model is shown to possess global forecast skill comparable to that of the operational GFS, while improving skill and better representing the diurnal cycle within the high-resolution area compared to the uniform mesh simulations. Thus, the model can better predict the evolution and propagation of precipitation events. Indeed, forecasts of the occurrence of extreme precipitation rates over the Southern Great Plains are shown to improve with the variable-resolution model. Case studies are provided of a squall line and a hurricane to demonstrate the effectiveness of the variable-resolution model to simulate convective-scale phenomena. This model represents an early attempt to extend fvGFS to convective scales. Despite the lack of specific development for convective-scale modeling, fvGFS still demonstrates promising results for its potential to unify global and regional modeling efforts. Much more work is underway at GFDL and with our university and research laboratory partners on FV3-based convective-scale prediction, with the goal of producing a unified prediction and simulation system for a wide array of forecast and research applications for the burgeoning international FV3 community. Figure 1. Geographical distribution of 145-case averaged precipitation rate (mm day-1): (a) StageIV observations, (c) GFS, (d) Uniform_ZC, and (e) Stretched_G. Panel (b) is terrain elevation ranging from 0 m (green) to 3800 m (brown). Figure 2. Composite radar reflectivity (dBZ) of (a, c) observations, and (b, d) Stretched_G at (a, b) 0900 UTC 1 May 2017, and (c, d) 2100 UTC 25 August 2017.